You and I are not so different. We’re literate, connected to the web, interested in other’s thoughts, and we read blogs, which puts us into a pretty small group of folks on the web. We have some common ground. I mean you are reading this. I had a crazy dream last night. In it, Seth Godin and I were playing golf in the same foursome. We had just teed off and driving to our golf balls in separate carts. While waiting for one of the players to hit, he pulled his cart next to mine and began to chat. I had a moment of anxiety as I thought to myself, “what in the world would I say to Seth Godin, other than, ‘you are great…I’ve read all your books'” and come across like a complete idiot. That question changed the imbalance, real or perceived, in the communication. I was no longer a fan, and he was no longer a celebrity. Suddenly, Seth Godin and I were on common ground, and we conversed like humans. People who’ve met former President Bill Clinton share stories where he removed the barrier of celebrity and spoke with (not to) them like a human. If there is no common ground, then there are two people talking (up/down) to one another, and that’s hardly a conversation. 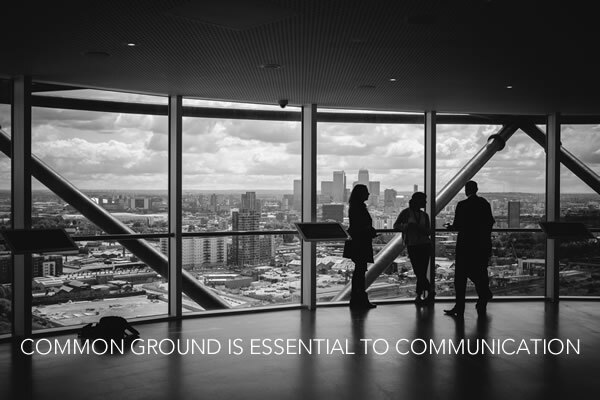 Common ground is essential to communication, and ultimately relationship. We are all connected by common interests, friendships, family, profession, hobbies, and passions. The challenge is to dig to find them. Whether marketing, networking, or simply getting to know someone, there are so many great social media tools to find that common ground–and no that’s not necessarily stalking. The problem is, we’re often too hurried to find it. Hey Charles, thank you for making your picture available for me to use. You’re awesome.